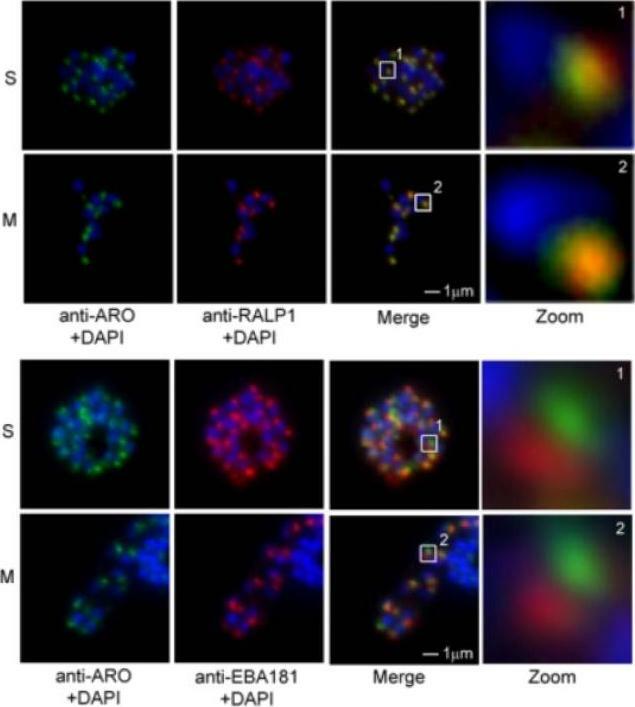 Colocalization studies of RALP1 with rhoptry and microneme marker proteins. (A and B) RALP1-C-specific antibodies (green) colocalize with the rhoptry protein RAP1 (red) (A) and predominantly colocalize with CLAG9 a rhoptry-specific marker, (red) (B) in fixed schizonts (s) and free merozoites (m) using RAP1- and CLAG9-specific antibodies, respectively. (C and D) RALP1-C-specific antibodies (green) visualize a different compartment within the parasite than the microneme marker proteins EBA-175 (red) (C) and EBA-181 (red) (D), as is evident in the merge of the two fluorescence photomicrographs. Nuclei were stained blue (DAPI).Haase S, Cabrera A, Langer C, Treeck M, Struck N, Herrmann S, Jansen PW, Bruchhaus I, Bachmann A, Dias S, Cowman AF, Stunnenberg HG, Spielmann T, Gilberger TW. Characterization of a conserved rhoptry-associated leucine zipper-like protein in the malaria parasite Plasmodium falciparum. Infect Immun. 2008 76:879-87.